Vous serez traité comme une "bénédiction" dans un cadre typique du Costa Rica! Cette suite comprend une cuisine entièrement équipée, une salle de bains, un dressing et une télévision par câble / coin lecture, juste en face de la grande piscine profonde entourée de jardins tropicaux luxuriants pour un séjour agréable loin de la maison. .
Tout au long de notre propriété, vous serez traités comme une "bénédiction" avec des salutations amicales et toute l'aide dont vous avez besoin pour vos merveilleuses vacances. Megumi est un mot japonais qui signifie bénédiction, abondance et grâce. C'est ainsi que vous serez traité ici. Cette unité est appelée "Orchid Room Suite" a un patio couvert, situé juste à côté de la piscine, entouré de jardins tropicaux et d'arbres matures. Voyant de belles lumières de la nuit sur la piscine avec un verre de vin dans la main sur la terrasse peut être très romantique. Nos locations de vacances sont situées dans une propriété de 6 acres remplie de divers types de fleurs tropicales, de plantes et d'arbres matures. Vous pourrez regarder plus de 50 sortes d'oiseaux, d'animaux, et des vues lointaines sur l'océan et des couchers de soleil depuis le bureau de Casa Grande. Vous séjournerez dans une propriété entièrement clôturée et fermée pour votre vie privée et votre sécurité. Notre piscine est toujours claire et bien entretenue pour votre plaisir. Et, vous pouvez garer votre voiture dans un grand parking gardé pour nos clients. Ménage amical, services de ménage, services de blanchisserie, nourriture costaricienne authentique, massages thérapeutiques et séances de coaching professionnel sont disponibles sur demande préalable. Nous comprenons l'importance de l'Internet haute vitesse ou du WiFi pour nos clients. Ainsi, il est offert à nos clients comme un service gratuit dans toutes les unités de location: à l'intérieur et à l'extérieur des unités ainsi qu'au bord de la piscine. Votre désir d'être connecté avec vos proches et votre entreprise est compris et respecté à notre place. Pour vos aventures, différents types de visites peuvent être organisées: volcans, sources d'eau chaude, plages, tours de canopée, rafting, jardins de papillons, jardins d'orchidées, plantations de café, randonnées, Cloud Forest, églises célèbres, marchés aux puces, musées, San Jose, Escazu, et d'autres sites touristiques. Nous sommes à seulement 3 miles du centre-ville d'Atenas, qui a de nombreux restaurants, supermarchés, cabinets médicaux et dentaires, banques, la poste, et de nombreux autres endroits dont vous avez besoin pour une vie ordinaire. Atenas a de nombreux retraités des États-Unis, du Canada et de l'Europe et est connu pour avoir une communauté d'expatriés très active et favorable qui ne se trouve pas ailleurs. Beaucoup de nos invités sont des retraités, de jeunes parents avec des enfants d'âge scolaire et d'autres sont des professionnels indépendants de l'endroit qui travaillent en ligne depuis chez nous. Nous comprenons à la fois leurs besoins. Si vous cherchez un hébergement décontracté, relaxant, abordable et beau pour vos vacances aventureuses ou pour votre travail professionnel en ligne au Costa Rica, oui, vous êtes au bon endroit! Bienvenue à la Casa de Megumi, où vous serez traité comme une bénédiction! Mots-clés: Casita, casa, condo, suite, chambre avec cuisine, douche eau chaude, Internet haut débit, WiFi, piscine, clôturé, propriété fermée, commodité, centre-ville Atenas, maison d'hôtes, retraité, tour, aventure, locations de vacances , WiFi, appartement, chambres à louer, bonne sécurité. We stayed for a month in the orchid room. It was perfect . Everything we needed was available. The bus stopped just in front. Pool was immaculate, grounds beautifully kept. View from our porch was amazing The best thing about our stay was our host Hisano she was a weath of knowledge of the area. Arranged to have us picked up at airport also had a rental car delivered to us. She brought us to town for groceries and took care of our CR SIM card. We felt so comfortable staying here. Thanks Hisano for making out 1st trip to CR so memorable. Coco her dog was a delight also. My wife and I stayed for one month at Hisano's Orchid Room. During our stay we received as much or as little attention as we liked. Hisano always had time to talk with us and spent a lot of time telling us about parks and attractions in the Atenas area. 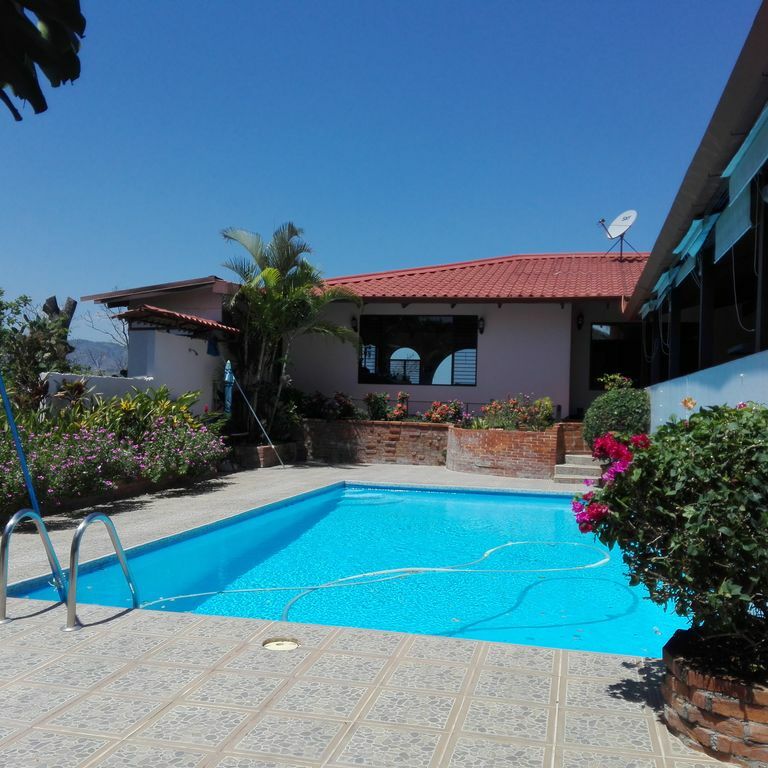 This is a great location for those that just want to relax by the pool all day or, like my wife and I, want a starting point to explore Costa Rica by car. Many parks and attractions are only several hours drive from this location. We would take off in the morning for the beach, rainforests or volcanos and be home in time for a drink and a dip in the pool, before preparing dinner. The Orchid Room is very comfortable for two, with an adequate kitchen, dining area, walk in closet, large walk in shower, queen bed and reading & TV area. Hisano arranged our pick up at the airport and had our rental car brought to the property as promised. After arriving at the property she had dinner waiting for us the first night. She was also kind enough to take us into Atenas the first morning for some supplies before our car arrived. This was our first stay in Costa Rica and we appreciated all the help and advice given during our stay. Driving can be stressful the first few days in Costa Rica, but I got used to the does and don't in short order. This property is truly a great central location for people that like to explore this beautiful country. The property is gorgeous and Hisano is a wonderful hostess! We enjoyed our stay very much and look forward to visiting again soon! Highly recommended! Our stay in Atenas was made all that much better by our stay at this property. Our "room" was like a little apartment. Every morning I made breakfast and we ate out on the porch overlooking the pool in our rocking chairs. The beautiful tropical flowers, plants, and trees made it feel like paradise. Our host was warm, friendly, and very hospitable. From the moment we inquired about the property to our arrival to our departure, Hisano was a wealth of information. She arranged for our pick up at the airport and arranged for our rental car to be delivered to our door the next day. She showed us around town and helped us become familiar with everything we would need for our stay in Costa Rica. We felt very well cared for. We loved our stay and would highly recommend this property. We would definitely stay here again. I enjoyed every minute of my stay, the property was as presented and the people were very helpful and responsive.. I stayed in the Orchid Room at Casa de Megumi for two weeks in July. It was nothing short of perfect. A beautiful room with high ceilings, ample bathroom, walk in closet, fully-equipped kitchen and a veranda overlooking the pool and the mountains across the way -- it was exactly right. From the first moment to the last, Hisano took excellent care of me, provided what was needed, and saw to it that I had the information and amenities I needed. The accommodations were sparklingly clean and well-cared for, including the grounds and pool. In all ways, it was evident to me that everything about Casa de Megumi was held lovingly and provided the best in customer service, comfortable accommodations and plenty of possibilities depending on what you wanted to do. I was on a mostly work trip and had as much solitude as I needed. When I was traveling (with my daughter and her friend later during my stay), I rejoiced in coming home to Hisano's house. Atenas, the town nearby, has everything you need -- banks, ATMs, a great grocery store that caters to expats, a fruit and veggie open air market on Fridays, restaurants, easy access to the highway, etc. There are plenty of gas stations around, the roads are quite good (if windy and hilly) and I had no problem getting around in the car I rented (with good tips from Hisano). We went to the beach (Manuel Antonio and Playa Herradura) and to a local chocolate tour. The girls went up to Monteverde and La Fortuna, also possibly in day trips, though these are full days. I have nothing but good things to say. Thanks to Hisano and her terrific staff, Casa de Megumi is a very special place. Even the hummingbirds know -- they come for breakfast at the flowering plants next to the pool! Nous sommes sur la ligne de bus pour le centre-ville d'Atenas; les voitures de location sont recommandées, mais pas nécessaire.